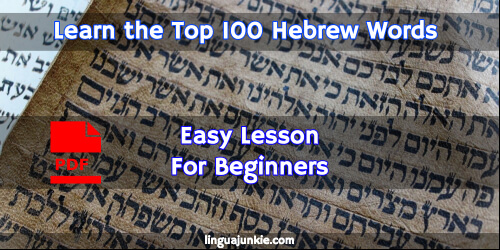 December 19, 2016 by The Junkie 3 comments on "Learn the Top 100 Hebrew Vocabulary Words (PDF Lesson)"
This lesson is GOLD for Beginner Hebrew learners. People pay money for books with this. It’s also a WASTE of time for anyone not TRYING to learn Hebrew. What you’re getting is the top 100 Hebrew Vocabulary Words List and a PDF version as well. These are 100 of the most used words in daily life. Don’t worry too much about their order or why something might be missing – one easy step at a time, my friend. PDF lesson is at the bottom of this lesson for anyone that wants to keep this. Is learning 100 Hebrew Vocabulary Words Scary? NO!! 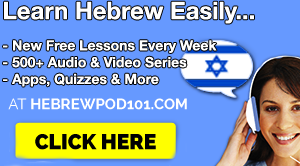 ✅ Hey, if you REALLY want to learn & speak Hebrew with 500+ audio/video courses, lessons by Hebrew teachers – Sign up at HebrewPod101 (click here) and start learning! I recommend ’em as a teacher & learner. 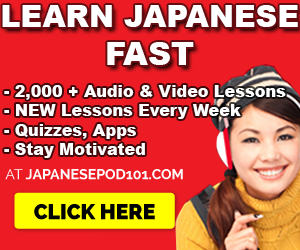 How to learn: Now, 100 is a lot of words, right? Don’t be scared. Take a look. There are 30 days in a month. 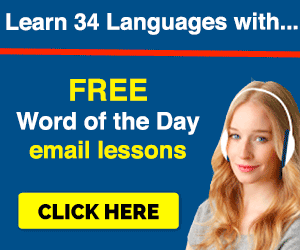 If you just learn 3-4 Hebrew words a day (multiply 3 or 4 times 30…that’s 90 or 120), you’ll learn all 100 in a month easily. So learn 3 on one day, learn 4 on another. That’s it. Easy. אפריל april April noun m.
זרוע z’roa’ arm noun f.
אוגוסט ogust August noun m.
גב gav back noun f.
רע ra bad adjective m.
יפיפה yefeyfe beautiful adjective m.
בשרבקר b’sar bakar beef noun m.
בירה birah beer noun f.
גוף guf body noun m.
לוחשנה luach shana calendar noun m.
חזה chazeh chest noun m.
עוף of chicken noun m.
שעון sha’on clock noun m.
קפה kafe coffee noun m.
טבח tabakh cook noun m.
דצמבר detsember December noun m.
קשה kashe difficult adjective m.
רופא rofe doctor noun m.
קל kal easy adjective m.
שמונה sh’moneh eight noun f.
עובד o’ved employee noun m.
מהנדס mehan’des engineer noun m.
רחוק rachok far adjective m.
פברואר februar February noun m.
אצבע etz’ba finger noun f.
דג dag fish noun m.
חמש chamesh five noun f.
כףרגל kaf regel foot noun f.
ארבע arba four noun f.
יוםשישי yom shishi Friday noun m.
טוב tov good adjective m.
שלום. Shalom. Goodbye. expression m.
יד yad hand noun f.
ראש rosh head noun m.
שלום. Shalom. Hello. expression m.
שעה sha’ah hour noun f.
מהשלומך? Mah shlom’cha? How are you? expression m.
ינואר yanuar January noun m.
יולי yuli July noun m.
יוני yuni June noun m.
כבש keves lamb noun m.
רגל regel leg noun f.
מנהל menahel manager noun m.
מרץ merts March noun m.
מאי mai May noun m.
דקה dakah minute noun f.
יוםשני yom sheni Monday noun m.
קרוב karov near adjective m.
תשע tesha nine noun f.
נובמבר november November noun m.
אחות achot nurse noun f.
בשעה besha’a o’clock noun f.
אוקטובר october October noun m.
אחת achat one noun f.
שוטר shoter police officer noun m.
בשרחזיר b’sar chazir pork noun m.
מתכנת metakh’net programmer noun m.
אישמכירות ish mechirot salesman noun m.
יוםשבת yom shabat Saturday noun f.
שניה sh’niyah second noun f.
ספטמבר september September noun m.
שבע sheva seven noun f.
שש shesh six noun f.
קטן katan small adjective m.
בטן beten stomach noun f.
יוםראשון yom rishon Sunday noun m.
תה teh tea noun m.
מורה morah teacher noun f.
עשר eser ten noun f.
תודה todah Thank you! noun f.
שלוש shalosh three noun f.
יוםחמישי yom chamishi Thursday noun m.
היום hayom today noun m.
מחר machar tomorrow noun m.
יוםשלישי yom shlishi Tuesday noun m.
שתיים shtayim two noun f.
מכוער mecho’ar ugly adjective m.
מים mayim water noun m.
יוםרביעי yom revi’i Wednesday noun m.
שבוע shavu’a week noun m.
יין ya’in wine noun m.
שנה shanah year noun f.
אתמול etmol yesterday noun m.
אפס efes zero noun m.
Wow, you made it all the way down. I truly hope you printed this Hebrew vocabulary words list or printed the PDF Copy. Looking for the PDF Lesson? Click on the link or the image below. Some people like having PDFs because they’re like e-books. You can save and read them on your phone. And that’s it. What’s next? Do you want more? A top 500 list? Stay tuned, I’ll be posting more lessons with adjectives, nouns, verbs and more. Leave a comment. I read them all. P.S. I highly recommend this for Hebrew learners. 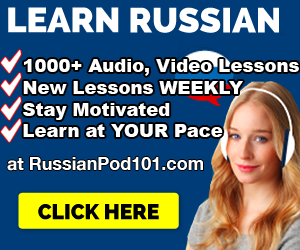 If you REALLY want to learn to Hebrew with 500+ audio & video courses by real teachers – Sign up for free at HebrewPod101 (click here) and start learning! Hey this is great! I am looking forward for top 500, would be even better if there were more IT related words.